SYCORAX has closed and I am now preparing myself to take on the rest of my summer. But first, I believe a little reflection is called for. My time with the Weird Sisters Collective in Austin, TX was a good one. In the sweltering Texas heat I took on the role of a lifetime. 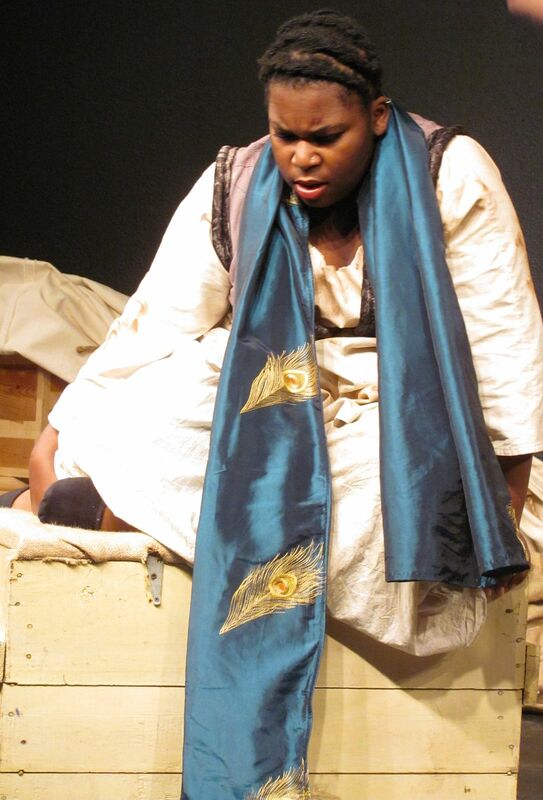 For those of you who didn’t get a chance to see the show, I played both Sycorax, healer of Algiers, and her son Caliban. The sometimes suave, sometimes gruff Caliban made appearances in both the pre-show performance of an excerpt of the Tempest and in the epilogue of SYCORAX. Working collaboratively together, we built SYCORAX from a lean script and some bolts of fabric into a dynamic peformance experience. The process of moving from rehearsal to opening was documented by a visiting scholar, Ann Pleiss Morris, who will be including an account of the show in a chapter of her forthcoming dissertation. I think that I can speak for all of us when I say that the more time that we spent working with the collective, the more we felt invested and (dare I say it?) loved. Each of the performances, with their audiences of varying sizes, was unique, each show having its own energy, its own life. SYCORAX was a truly engaging and thought-provoking performance experience, not just for me, but for the critics as well. If you want to know what the reviewers had to say about SYCORAX and the Weird Sisters Collective, check out the links at the bottom of this post. Overall, I have to share with you all that I am not sad to be leaving Sycorax behind, because something tells me that this will not the last that I see of her. Stay tuned, folks. Sycorax will live on, and I’ll let you know more about it just as soon as I get the details myself. In the meanwhile, my people, stay cool.